German Economic Sentiment; UK employment data; Mark Carney’s speech and inflation report; US unemployment claims, PPI, consumer sentiment are the major topics in Forex calendar. Check out these events on our weekly outlook. The US economy gained momentum last week with an excellent ISM Non-Manufacturing PMI release climbing to 58.7 from 56 points in June, indicating continued growth in the largest sector of the economy. The reading showed strong gains across the board. The employment component is up from 54.4 to 56 points and factory orders topped predictions with a 1.1% rise. Further good news came from the US labor market with a 14,000 drop in the number of new unemployment claims. Both readings reflect the strong growth trend in US economy. Will this rise continue? Eurozone German ZEW Economic Sentiment: Tuesday, 9:00. German analyst and investor climate continued to decline in July, falling to 27.1 points from June’s 29.8. Economists expected a higher reading of 28.9. Current conditions index also fell to 61.8 points from 67.7 in May, however still positive indicating a shift towards a domestically driven recovery in Germany. Nevertheless, the second quarter growth rate is expected to be lower than registered in the first quarter. This decline will also affect the Eurozone growth rate. German analyst and investor index is expected to plunge to 18.2. UK employment data: Wednesday, 8:30. The Unemployment rate in Britain fell to 6.5% from March to May, reaching following 6.6% in the previous three months. The number jobseeker’s fell by 36,300 to 1.04 million. Prime Minister David Cameron noted that the rate of employment matched the record level set in 2005, indicating stronger British economy. However wage growth is at its lowest since 2009, while excluding bonuses average wage increases are their lowest since 2001. If this trend continues it will have a negative effect on economic growth. The number of jobless Britons is forecasted to decline 29,700 and the unemployment rate is expected to drop to 6.4%. Mark Carney speaks: Wednesday, 9:30. Bank of England governor Mark Carney will hold a press conference in London about the inflation report. The Governor stated he was pleased with the rise in inflation, noting it came close to the BOE’s target of 2%. Market volatility is expected. US retail sales: Wednesday, 12:30. Retail sales in the U.S. advanced solidly in June. Core sales, excluding automobiles, gasoline, building materials and food services, edged up 0.6% following a revised 0.2% in May. Core sales are the best gauge for consumer spending component of gross domestic product. June’s gains indicate an upward trend in consumer spending in the second quarter. However retail sales gained only 0.2% in June after posting a 0.5% rise in May. Retail sales are expected to gain 0.2%, while core sales are predicted to edge up 0.4%. US Unemployment Claims: Thursday, 12:30. The number of US initial Jobless claims fell 14,000 last week to a seasonally adjusted 289,000. The reading was well below the 305,000 forecasted by analysts, indicating the US labor market continues to improve strengthening the US economy. The four-week average declined 4,000 to 293,500. That’s the lowest average since February 2006. The number of workers continues to grow as well as higher waged which will boost consumer spending in the coming months. The number of initial jobless claims is expected to reach 307,000 this time. UK GDP data: Friday, 8:30. Britain’s economy is expected to advance 0.8% in the second quarter matching the first estimate issued in July. The anticipated advance marches the UK economy to prerecession levels. The positive forecast indicates, recovery is back on track, but wage growth needs to rise in order to sustain long term recovery. The second GDP estimate is expec6ted to remain unchanged at 0.8% growth rate. US PPI: Friday, 12:30. U.S. producer prices edged up 0.4% in June amid rising gasoline costs, but overall inflation remained tame. Analysts expected a smaller rise of 0.2% as posted in the previous month. Gas prices jumped 6.4%, Steel costs edged up 3%. But prices declined for grains, cheese and rental cars to offset some of those increases. Nevertheless, inflation remains tame with in the Fed’s 2% target. Low inflation has enabled the Fed to pursue extraordinary measures to boost the economy but can drag down wages and spark a recession. U.S. producer prices are expected to rise 0.1%. US Prelim UoM Consumer Sentiment: Friday, 12:30. Consumer sentiment declined in July to 81.3 from 82.5 in June amid a fall in the consumer outlook index. Analysts expected the index to reach 83.5. Current economic conditions rose to 97.1 from 96.6, better than the 97.0 forecast. But consumer expectations plunged for a third straight month, to 71.1 from 73.5 below the 74.0 expected. Consumer sentiment is likely to improve to 82.7. The US Dollar advanced against most of its major counterparts this past week, but that doesn’t tell the whole story for the benchmark currency. In reality, the greenback was essentially little changed. That is better understood when we look to the Dow Jones FXCM Dollar Index (ticker = USDollar) which shows more than a week of congestion. Fundamentally, the dollar has been left adrift. High profile event risk has thinned out and the market’s obsession with rate forecasting has tempered. Yet, we might just find something far more provocative and capable to take up the currency’s reins: risk trends. As the world’s most liquid currency, the dollar tends to absorb one-off fundamental developments with limited impact on price and finds its motivation and bearings from the most systemic of financial drivers. Since mid-2013 when the Federal Reserve laid out specific targets for its change from an accommodative stance to a regime of normalization and rate hikes, monetary policy became a key driver. Yet, as wecome closer and closer to the inevitable rise in interest rates (still six months out if you’re in the more hawkish crowd or up to 12 if you’re a dove), the draw of this important mark of valuation has diminished. The central bank’s decision to abandon its hard targets was a big factor in the driver’s subsiding potency. Moving forward, rate speculation’s influence will be driven by data that meaningfully alters the consensus for timing and the market’s assessment on what is fairly and fully priced. Looking at Fed Funds futures, we find that the market maintains a sizable discount to the FOMC’s own forecast for rates. According to the last rate forecast produced after the June policy meeting, the benchmark rate is seen at 1.12 percent by the end of 2015 (they generally move in 25bp increments, but this is an average) and 2.50 percent by the close of 2016. Yet, we find the market pricing in 0.69 and 1.69 percent respectively. Event risk over the coming week will carry limited ability to sway rate forecasts one way or another. For data, we have a small business sentiment survey, retail sales, upstream inflation pressures (PPI) and the University of Michigan’s consumer confidence report. Considering that it took 2Q GDP, NFPs and the Fed’s own monetary policy meeting to forge the dollar’s advance through the end of July; this data will struggle for traction. In the meantime, we may see the FX market’s other dominant fundamental catalyst take over. While Treasury yields often stand in as a good proxy for interest rate forecast; they are also a reflection of global investor sentiment. As a top rated asset that has worked its way into the category of ‘risk-less’ and ‘cash equivalents’, the fixed income instruments have become synonymous with safe haven and are particularly appealing when liquidity is pinched. Separating the demand for yield from the demand for safe haven can be tricky. But both conditions – when engaged – are supportive for the dollar. Over the past year, many have wondered whether the ‘Risk-On-Risk-Off’ relationship has broken down. Given the recent swell in volatility readings for different asset classes and the building uniformity of deleveraging showing through in certain assets, the masses are starting to recognize that it has always been in play…it was simply awaiting conviction. As measures like the FX Volatility Index show consistency in their climb and benchmarks like the S&P 500 crash through ever more important levels of support, the appetite for the dollar (and the market it represents) will build. See the Weekend Strategy Video to learn more about the changing trends in volatility. Big Warning Sign for Japanese Yen - Time to Abandon Positions? 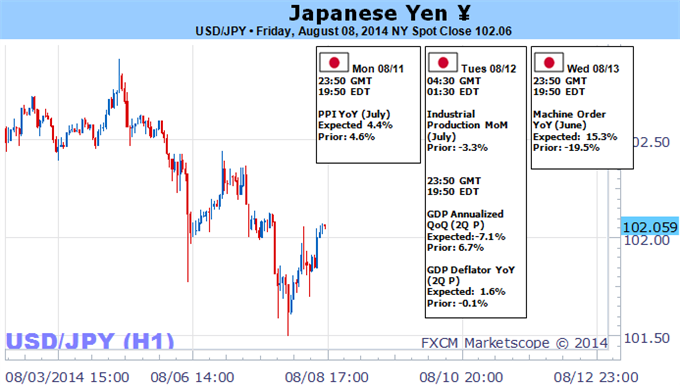 The Japanese Yen rallied sharply a complete lack of market news. Why is this significant, and what does it tell us about the next moves for the USDJPY? Professionals scrambled for explanations on why the USDJPY posted a sharp 50-point tumble in the typically-quiet period after London markets closed. And indeed some initially pointed to a so-called “fat finger trade”—where a trader accidentally places an especially-large order that sends markets reeling. Yet the truth was far simpler: there was indeed a spike in USDJPY selling (Yen buying), but nothing about it seemed accidental. This fact is significant because large speculators were heavily short the Japanese Yen (long USDJPY) headed into the week, and recent price action suggests many are losing patience with those positions and exiting their trades. Thus the USDJPY looks likely to trade towards range lows unless we see an important shift in trader sentiment. Focus will turn to upcoming Japanese GDP growth figures for the second quarter, as these economic figures will be the first to include government consumption tax hike. Consensus forecasts predict that the economy posted its worst quarter for growth since the global financial crisis. It is subsequently surprising to note that the Bank of Japan shows little willingness to ease policy further. Yet any worse-than-expected figures may force the USDJPY higher as pressure mounts on the central bank to act. Japanese Yen volatility prices have risen sharply off of recent record lows as traders position for bigger moves ahead. Whether or not the USDJPY breaks significantly out of its recent range could very well depend on key economic data. It will likewise be important to watch volatility in broader financial markets as the US S&P 500 drops sharply off of recent record peaks. Whether or not equities can recoup losses may likewise dictate price action in the USDJPY. The Australian Dollar extended its recent declines over the past week on the back of broad-based risk aversion and disappointing domestic data. Heightened geopolitical turmoil sapped demand for the high-yielding currency as traders flocked to the perceived safety of the Yen and US Dollar. Additional pressure was put on the currency following an unexpected jump in the local unemployment rate to a 12 year high. Looking ahead, if we see tensions surrounding the Middle East or Ukraine escalate, the Aussie could face further weakness in the short-term. However, we have witnessed several flare-ups of geopolitical tensions in recent months, which have failed to leave a lasting impact on the currency. This suggests that if the swell settles from the most recent storm of volatility, the currency may be afforded some breathing room. Consumer and business confidence figures are the only noteworthy pieces of domestic data on the calendar over the coming week. The leading indicators for the health of the local economy have reflected some resilience in recent months, yet remain subdued. Another lackluster set of readings would further reinforce the need for highly accommodative RBA policy to remain in place. Despite recent local data softening the Reserve Bank is likely to retain its preference for a ‘period of stability’ for rates over the near-term. Based on recent rhetoric from the Board it would take a material deterioration in incoming economic indicators to re-open the door to rate cuts. At the same time, policy tightening is likely to be delayed. Indeed swaps-implied expectations for rates slipped back into negative territory over the past week. This does little to raise the carry appeal of the currency and leaves the Aussie in a precarious position. Upcoming Chinese Retail Sales and Industrial Production data will also be on the radar for Aussie traders. Incoming data from the Asian giant has been relatively positive on balance, which has eased concerns over a deceleration in economic growth. 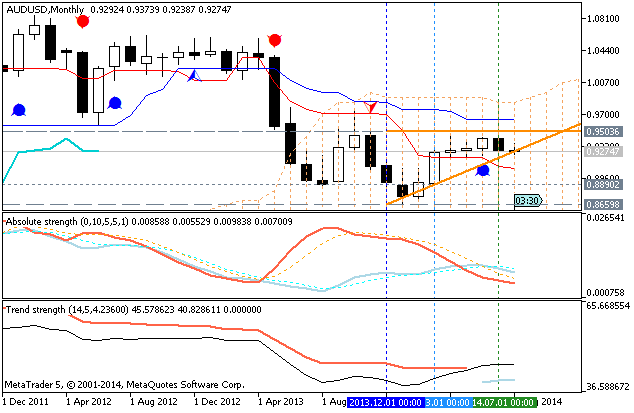 If the next week’s figures continue this recent trend it could ease some of the selling pressure facing the AUD. AUD/USD is drawing closer towards the 92 US cent handle, which has been a line in the sand for the pair since late March. If broken, it would set the stage for a sustained decline to the psychologically-significant 0.9000 handle. 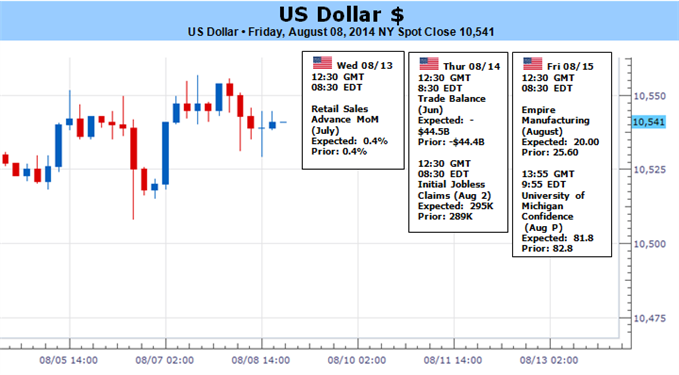 Refer to the US Dollar outlook for insights into how the USD side of the equation may influence the pair. Gold snapped a three-week losing streak with an advance of 1.44% to trade at $1312 ahead of the New York close on Friday. The advance comes amid continued weakness in broader equity markets with all three US stock indices posting weekly losses across the board. With mounting concerns over new US military involvement in Iraq and the ongoing turmoil seen in Gaza and Ukraine, the onset of more classic risk aversion flows have been identified with gold likely biggest beneficiary. However, with the precious metal closing the week just below key near-term resistance, the focus shifts to the initial August range. Looking ahead to next week the US economic docket will be rather light with only retail sales, industrial production and the University of Michigan Confidence survey on tap. As such, look for broader market sentiment to continue driving price action with all eyes on the growing geo-political tensions in the Middle East and Ukraine. Should the conflicts intensify or if the recent stock sell-off persists, look for gold to remain well supported with a breach above near-term resistance keeping our medium-term bias weighted to the topside heading deeper into August trade. From a technical standpoint, this week’s rally saw a break of the initial monthly opening range at the 50-day moving average ($1296) before rebounding off key near-term resistance at $1320/21. This region is defined by the 38.2% Fibonacci extension taken from the late-December rally and the 61.8% retracement of the July decline and will serve as our bearish invalidation level- a breach above this threshold shifts the focus higher in gold heading into the August close with such a scenario eyeing subsequent resistance targets at $1334, $1345 and $1367/71. Note that the July sell-off saw daily momentum hold support at 40, suggesting that last month’s pullback may have been corrective in nature. Ultimately a breach/close above $1321 / RSI break above 60 is needed to validate this assertion. Bullish invalidation rests at $1292 with only a break the 200-day moving average and the August opening range low at $1280 shifting the focus back to the short-side. Support targets are eyed approximately every $10 sub-$1280 with more significant technical support seen at the 61.8% Fibonacci extension taken off the decline off the 2014 high at $1251. The outlook for monetary policy continues to be the dominant driver of British Pound price action. Indeed, the correlation between GBPUSD and the UK 2-year Gilt yield – a reflection of investors’ near- to medium-term interest rate outlook – is now at a formidable reading of 0.73 (on rolling 20-day studies). Last week’s BOE announcement proved to be a non-event, with Governor Mark Carney and company leaving the setting of monetary policy unchanged and publishing no explanatory statement to lay out their reasoning going forward. The week ahead ought to be more eventful as the central bank unveils its quarterly Inflation Report. The document and the press conference following its publication have served as the primary vehicle for officials to communicate major changes in their outlook for the economy and introduce changes into the policy mix. A shift in strategy this time around is unlikely: February’s re-tooling of the “forward guidance” framework to focus on the loosely-defined objective of reducing spare capacity has arguably left enough space to maneuver for the rate-setting MPC committee such that it can adjust its posture without scrapping the policy regime entirely. That means investors’ primary points of interest will be any updates to the BOE’s economic forecasts and the tone of its rhetoric. Needless to say, these will be evaluated in an attempt to gauge when the bank might feel comfortable raising interest rates. The markets’ hawkish policy outlook moderated significantly in July, with GBPUSD marching lower alongside front-end yields to break its 2014 uptrend and finish last week with the weakest close in two months. As we argued a month ago, that makes sense. UK economic data outcomes have tended to underperform relative to consensus forecasts since February, suggesting that building a hawkish voting majority on the MPC will be a tall order in the near term. With that in mind, Sterling has now fallen for five consecutive weeks. This suggests that the Inflation Report will probably need to deliver an outsized dovish surprise in to maintain momentum behind the down move. On the other hand, a status-quo outcome may paint the recent selloff as a bit one-sided, opening the door for a corrective bounce. Higher inflation data and the belief the Reserve Bank of Australia’s next move will be an interest rate hike, helped drive the AUD/USD into a new high for the year at .9504 last month. An improving economy in China also helped underpin the Forex pair at times during July. However, the stronger U.S. Dollar and the dumping of higher-risk assets helped drive the Aussie down during the last week of the July, leading to a lower close for the month. Technically, the AUD/USD posted a potentially bearish closing price reversal top. This chart pattern will be confirmed by a break through .9278. Typically, a closing price reversal top signals the start of a 2 to 3 month correction of the last rally. The last rally was .8659 to .9504, making .9081 to .8982 the next likely downside target. Last month, selling pressure came in as the market approached a downtrending angle and a major 50% level at .9573. The angle drops in at .9556 this month. The selling pressure late in the month also put the market on the weakside of another downtrending angle at .9356. This angle is resistance this month. The first downside target in August is the uptrending angle at .9219. This is followed by the Fibonacci level at .9218. These two levels combine to form a solid support cluster. Watch for a technical bounce on the first test. Once this area is cleared, look for a drive into the retracement zone at .9081 to .8982. The closing price reversal top gives the market a downside bias this month. Furthermore, the high at .9504 has the potential to become a bearish secondary lower top. Fundamentally, the strengthening U.S. economy along with concerns about Ukraine, Gaza and general weakness in the global economy may lead to more risky asset liquidation that should keep the pressure on the Aussie throughout the month. Last edited by 1Finance; 08-09-2014 at 05:21 PM. The dollar slid lower against the other major currencies on Friday as heightened geopolitical risks prompted investors to take profits following the greenback’s recent run higher. The drop in the dollar came after the U.S. launched airstrikes in Iraq, in a bit to halt the advance of extremists in the country’s north, while a breakdown in the ceasefire between Israel and Gaza also soured market sentiment. Meanwhile, fears over hostilities between Russia and Ukraine eased on Friday after Russia’s defense ministry said it had concluded military exercises it was holding close to the border with Ukraine. EUR/USD was up 0.35% to 1.3410 late Friday, trimming the week’s losses to 0.13%. On Thursday, European Central Bank President Mario Draghi indicated that the bank was pleased with the weaker exchange rate for the euro, which should help to bolster inflation and shore up exports. USD/JPY ended Friday’s session down 0.06% at 102.03, after falling to a more-than two week low of 101.50 earlier in the session. The greenback was also weaker against the Swiss franc, with USD/CHF sliding 0.38% to 0.9053 at the close. The US Dollar Index, which tracks the performance of the greenback versus a basket of six other major currencies, was down 0.17% to 81.46, off Thursday’s 11-month highs of 81.78. Elsewhere Friday, the Canadian dollar weakened against its U.S. counterpart after official data showed that the country’s economy added fewer than expected jobs in July. Statistics Canada reported that the economy added just 200 jobs last month, falling well short of expectations for jobs growth of 20,000. The unemployment rate ticked down to 7.0% from 7.1% in June. USD/CAD was up 0.45% to 1.0973 late Friday, from 1.0908 ahead of the release of the jobs report. In the week ahead, investors will be continuing to monitor geopolitical risk, while preliminary data on second quarter growth from the euro zone and Japan will be closely watched. Markets watchers will also be looking ahead to Wednesday’s inflation report from the Bank of England and the U.S. report on retail sales. Japan is to release data on tertiary industry activity. Later in the day, Canada is to release data on housing starts. Australia is to release reports on business confidence and house prices. The U.K. is to release private sector data on retail sales. The Bank of Japan is to publish the minutes of its latest policy meeting, which contain valuable insights into economic conditions from the bank’s perspective. Japan is to publish preliminary data on gross domestic product, the broadest indicator of economic activity and the leading measure of the economy’s health. Australia is to publish data on consumer sentiment and the wage price index. China is to release a report on industrial production. The U.K. is to publish data on the change in the number of people employed and the unemployment rate, as well as data on average earnings. Later in the day, the BoE is to publish its quarterly inflation report and Governor Mark Carney is to speak. The U.S. is to publish data on retail sales and business inventories. New Zealand is to release data on retail sales as well as a private sector report on manufacturing activity. Japan is to publish data on machinery orders. The euro zone is to publish preliminary data on gross domestic product, in addition to revised data on consumer price inflation. Elsewhere in Europe, Switzerland is to release data on producer price inflation. Canada is to produce data on new house price inflation. The U.K. is to release revised data on GDP growth. Canada is to publish data on manufacturing sales. The U.S. is to round up the week with reports on manufacturing activity in New York state and industrial output, as well as preliminary data on consumer sentiment. The dollar fell to more than two week lows against the yen on Friday as escalating geopolitical tensions bolstered safe haven demand, before retracing most of its losses late in the session. USD/JPY ended Friday’s session down 0.06% at 102.03, after falling to a more-than two week low of 101.50 earlier in the day. The pair ended the week with losses of 0.53%. The pair is likely to find support at around the 101.40 level and resistance at 102.60. The dollar later trimmed back losses as fears over hostilities between Russia and Ukraine eased after Russia’s defense ministry said it had concluded military exercises it was holding close to the border with Ukraine. In the U.S., data on Friday showed that wholesale inventories rose by a smaller than forecast 0.3% in June. Elsewhere Friday, the yen ended lower against the euro, with EUR/JPY rising 0.31% to 136.83, paring the week’s losses to 0.65%. He also played down concerns over the recent slowdown in inflation, saying it is mostly due to energy prices. In the week ahead, investors will be continuing to monitor geopolitical risk. Wednesday’s preliminary data on second quarter growth from Japan and the U.S. report on retail sales will also be in focus. Ahead of the coming week, Investing.com has compiled a list of these and other significant events likely to affect the markets. The guide skips Tuesday as there are no relevant events on this day. The U.S. is to publish data on retail sales, the government measure of consumer spending, which accounts for the majority of overall economic activity. The U.S. dollar strengthened against the Canadian dollar on Friday after data showed that the Canadian economy added fewer-than-expected jobs in July, underlining concerns over the outlook for economic growth. The pair is likely to find support at around the 1.0900 level and near-term resistance at 1.0985, Wednesday’s high and a three month peak. The report contrasted with recent economic data indicating that the economic recovery in the U.S. is deepening. Concerns over rising geopolitical tensions continued to dominate market sentiment after the U.S. launched airstrikes in Iraq, in a bit to halt the advance of extremists in the country’s north. A breakdown in the ceasefire between Israel and Gaza also fuelled widespread risk aversion. However, fears over hostilities between Russia and Ukraine eased on Friday after Russia’s defense ministry said it had concluded military exercises it was holding close to the border with Ukraine. In the week ahead, investors will be continuing to monitor geopolitical risk. Markets watchers will also be looking ahead to Wednesday’s U.S. report on retail sales, as well as reports on Canada’s hosing sector. Canada is to release data on housing starts, a leading indicator of demand in the housing sector.